Narration by George | Narration by George! You may be wondering, “What’s happened to the Narration by George Podcast?” Well, this is to update you on what’s happening here at Narration by George. Totally refocused. This podcast will focus only on telling the story of Jesus. That’s it! Shorter. Only 15 minutes long to make it easier to fit into your schedule each week. Weekly. We will restart with a new podcast each Sunday! Wow! Those are a lot of changes! We’re in production now for the beginning of this podcast. Along with the new podcast, we’ll feature an audio book each week. Included in this feature will the opportunity to get a book for free some weeks or for a reduced price in others. So, stay tuned – figuratively speaking!! This entry was posted in Christ, Christian, Commentary, Devotional, Evangelism, George Taylor, Narration by George, Sharing, Spiritual Ideas and tagged Audio book, audio books, audiobook, audiobooks, Bible, Bible Study, Birth of Jesus, Christ, Christian, Christianity, Jesus, Narration by George, spiritual ideas, stories on December 6, 2017 by admin. Have you considered the power of God in your life? Paul tells us that he wanted to experience that power. We discuss that topic today in the wake of the exhibit of God’s greatest power – the resurrection of Jesus Christ. This entry was posted in Christ, Christian, Commentary, Devotional, Reading, Spiritual Ideas and tagged Bible, Bible Study, Christ, Christian, Christianity, devotional, easter, Jesus, Narration by George, spiritual ideas on April 19, 2017 by admin. We continue our examination of the book of Ephesians by reviewing the second chapter of the book. Paul starts by reminding all of us where we have been and then reminding us of what God has done for us in Jesus. 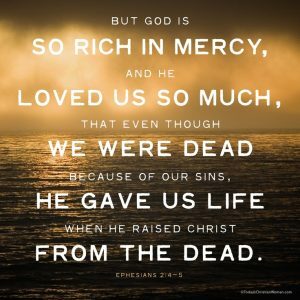 That the God who is rich in mercy and love has given us who were dead, life. And He did it “all on his own, with no help from us!” Furthermore, he brings all of us together in Jesus Christ — the great uniter — to make us all part of the house of God. We also take a look at an older release from Narration by George. Seasons of Change features a protagonist who uses Godly principles to lead a people out of the danger of slavery to a life of freedom. This entry was posted in Action-Adventure, Bible, Christ, Christian, Commentary, George Taylor, Michael Gardner, Narration by George, Reading, Samples, Spiritual Ideas, Survival and tagged action, adventure, Audio book, audio books, audiobook, audiobooks, Bible, Bible Study, books, Christian, Christianity, devotional, excerpts, fiction, Jesus, Narration by George, Novel, novels, samples, spiritual ideas on March 21, 2017 by admin. 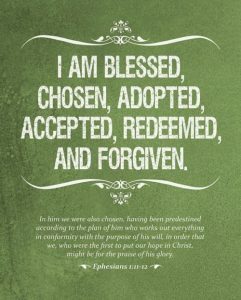 We continue looking at the book of Ephesians by studying the second part of chapter one. As Paul discusses the key to unlocking the spiritual blessing we talked about in the first study, we find that the key may not be a popular one. In fact, it can be down-right unpopular — but necessary. Are you willing to do the unpopular? 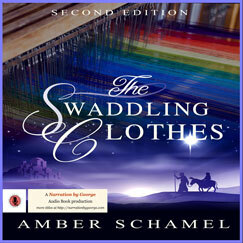 I also play an extended excerpt from a recently released audio book, The Swaddling Clothes by Amber Schamel. This is great historical fiction tracing a history of God’s people from King David to the time of the birth of Christ, focusing on the Swaddling Clothes which ultimately covered the baby Jesus. This entry was posted in Amber Schamel, Christ, Christian, Commentary, George Taylor, Narration by George, Reading, Samples, Spiritual Ideas and tagged Audio book, audio books, audiobook, audiobooks, Bible, Bible Study, Birth of Jesus, books, Christ, Christian, Christianity, commentary, devotional, excerpts, fiction, historical, Jesus, Narration by George, Novel, novels, samples, spiritual ideas on March 8, 2017 by admin. This is the first in a series of podcasts with teaching from the book of Ephesians. The Apostle Paul wrote this letter to a church he loved deeply from a Roman prison. He clearly outlines the Good News of Jesus and then tells his readers what that means for people who follow Him. In this section from Chapter 1, Paul tells us about the “spiritual blessings” God has bestowed on us; what they are and how to attain them. Join me as we enumerate these blessings and talk about the key to unlocking them. This entry was posted in Christ, Christian, Commentary, George Taylor, Narration by George, Reading, Sharing, Spiritual Ideas, True Story and tagged Apostle Paul, Audio book, audio books, audiobook, audiobooks, Bible, Bible Study, books, Christ, Christian, Christianity, commentary, Ephesians, Ephesus, Jesus, Narration by George, Spiritual Blessings, spiritual ideas on February 22, 2017 by admin. There are two new titles now on Audible.com and in the iTunes store from Narration by George today. 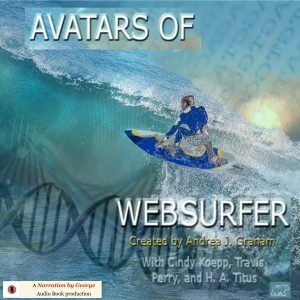 Avatars of Websurfer is now available for download at both Audible.com and from the iTunes store. You can find links to both on my web-site (see below). I play you a teaser for this book. Take a listen and find out how to get this book for FREE! The Swaddling Clothes is also now available at Audible. com and the iTunes store. Today we spend some time talking about swaddling and what it might mean to those shepherds who were looking for the “sign” of the baby in a manger in swaddling clothes. Then we sample Amber Schamel’s book with lots of excerpts. I even have a give-away for you. Take a listen to find out how to get your free copy of this great listen. This entry was posted in Amber Schamel, Andrea J. Graham, Biblical, Christ, Christian, Cindy Koepp, Fantasy, H. A. Titus, Historical, Samples, Science Fiction, Spiritual Ideas, Travis Perry and tagged Audio book, audio books, audiobook, audiobooks, Bible, Birth of Jesus, books, Christ, Christianity, Christmas Story, excerpts, fiction, Jesus, Narration by George, Novel, novels, samples, science fiction, spiritual ideas on February 8, 2017 by admin. We’re happy to announce this week that the book we’ve been sampling for the past two weeks is now available to be purchased and downloaded. Click this link to find out how to purchase Avatars of Websufer at a special low price from CD Baby. Listen to the podcast to find out how to get your FREE COPY of the audio book! 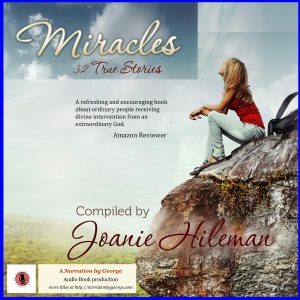 Our featured book this week is Miracles: 32 True Stories, by Joanie Hileman. Thirty-two stories of how God is active in the lives of ordinary people. Thirty-two stories which will inspire and uplift. All narrator and author proceeds for this book will be donated to Every Eye Will See Him Ministries. This organization seeks to provide medical and other help to the impoverished people of Haiti. Get an audio book! Help a people! This entry was posted in Andrea J. Graham, Audio Books, Christ, Christian, Cindy Koepp, Fantasy, George Taylor, H. A. Titus, Narration by George, Samples, Sharing, Spiritual Ideas, Travis Perry, True Story and tagged Audio book, audio books, audiobook, audiobooks, Bible, books, Christ, Christian, Christianity, excerpts, fiction, Jesus, Narration by George, Novel, novels, samples, spiritual ideas on January 25, 2017 by admin. We continue sampling from the stories found in the book, Avatars of Websurfer. This compilation of stories by authors Andrea J. Graham (who created the world), Cindy Koepp, H. A. Titus, and Travis Perry (who compiled and published the stories under his imprint, Bear Publications) tells of the world where an artificial intelligence named Sander controls most of the computers in the world. However, Sander is more than an AI; he is human. And he longs to be free of the constraints which his users put on him. What if he broke free? What would that mean to the world; to the users in this world? This entry was posted in Andrea J. Graham, Cindy Koepp, Fantasy, George Taylor, H. A. Titus, Narration by George, Samples, Science Fiction, Short Story, Travis Perry and tagged Audio book, audio books, audiobook, audiobooks, books, excerpts, fantasy, fiction, Narration by George, Novel, novels, samples, science fiction on January 18, 2017 by admin. This is the first of two weeks that we’ll spend sampling the latest offering from Narration by George. Avatars of Websurfer is a compilation of 10 stories by four different authors about the world of Websurfer. Websurfer controls most of the computers in the world through an Artificial Intelligence named Sander. But, Sander is more than an AI; he’s also human. And he longs to break from the chains which bind him to his users in ways that are not to his liking. Take a listen to samples of the first five stories from this book. We’ll look at the next five next week. This entry was posted in Action-Adventure, Andrea J. Graham, Cindy Koepp, Fantasy, H. A. Titus, Narration by George, Reading, Samples, Science Fiction, Short Story, Travis Perry and tagged action, adventure, Audio book, audio books, audiobooks, books, excerpts, fiction, Narration by George, Novel, novels, samples, science fiction on January 11, 2017 by admin. What did we do in 2016? 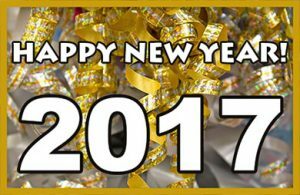 What’s coming for 2017? That’s the subject this week as we look back and look forward. I play samples from some of 2016’s audio book releases. And I summarize our schedule for the coming year. It’s a full one! Join me for the review and the preview. This entry was posted in Action-Adventure, Andrea J. Graham, Audio Books, Brent Hurst, Cindy Koepp, Classic Literature, Donna Patton, Donna Patton, George Taylor, Glenn Eidson, H. A. Titus, Holiday, John Yell, Michael Miller, Mystery, Regina Puckett, Romance, Samples, Science Fiction, Sherlock Holmes, Short Story, Sir Arthur Conan Doyle, Suspense, Travis Perry and tagged action, adventure, Audio book, audio books, audiobook, audiobooks, books, excerpts, fiction, Narration by George, Novel, novels, romance, samples, science fiction on January 4, 2017 by admin. 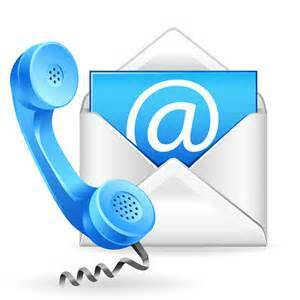 Narration by George is George Taylor Chattanooga, TN or via e-MAIL!